Arena Products Home — Prairie Panels Ltd.
Is your Community looking to make improvements to your Skating Arena or Curling Rink? Interested in reducing Operating Costs, and Saving $ Money? Invest in the time to learn more about Low-E Ceilings (Reflective Foil Insulation) for arenas and rinks, and how they work. Find out how they can save you operating expenses and extend your season! 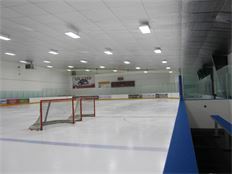 Prairie Panels has been installing Low E Ceilings in rinks across the Prairies for almost 20 years! In turn saving our clients thousands of dollars each operating season! Time to do some upgrades to your lobby or dressing room areas? Inter-locking Rubber Sport Flooring or Fiberglass Reinforced Wall Panels to eliminate painting and damage to dressing room and hallway walls?